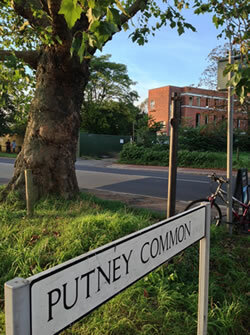 Judicial Review to protect Putney Common from Developers? "They Still Want To Build Roads On Putney Common . . ."
Plans to tarmac and urbanise a large swathe of Putney Common are contained in "easement agreements" which were signed in secret in February 2012 between Wandsworth Borough Council (WBC) and the charity that manages Putney Common, The Wimbledon and Putney Commons Conservators (WPCC). The Friends of Putney Common (FofPC) exposed the details of the agreements several months after they were signed. The group was set up by residents who are concerned that Common land will be lost forever. The access is to facilitate a development by WBC to build a five storey block of luxury flats and a 2FE primary school for 420 pupils on the site of the former Putney Hospital. The site is less than 0.5 hectares and is entirely surrounded by Common land and has no legal access. Sixty per cent of the land included in the planning application is common land, owned by the charity that manages it. “at all times keep the commons open, uninclosed, and unbuilt on” and “shall by all lawful means prevent, resist and abate all encroachments and attempted encroachments on the commons, and protect the commons and preserve them as open spaces, and resist all proceedings tending to the inclosure, or appropriation for any purpose of any part thereof”. WBC sought to get around the lack of access and the restricted space on the site by encroaching onto the common surrounding it and then paying the Conservators - the people who are elected by residents to protect the Common from encroachment and development - some £350,000 for allowing it. The Council also plans to give the Conservators, in exchange for the access and loss of common, another piece of land 3.5 miles away. The FoPC initially attempted to discuss its concerns informally with the Conservators and Council but to no avail. FofPC instructed environmental lawyers Richard Buxton and Barrister Philip Petchey, an expert in common land law to challenge the legality of the agreements. An application to the High Court was made earlier this year. Deputy High Court Judge, John Howell QC, in granting a Judicial Review, confirmed that the Conservators' position that it was entitled to grant easements and effectively sell off access rights to Common land was "arguable". Opposition to the proposal has been strong across the local community. Over 800 Putney residents objected - and more continue to object - to the planning application connected to the easement agreements. Richmond upon Thames Council, the Putney Society, nearby All Saints School and various other residents' groups have also objected. The Councils’ proposals were even criticised by the Commons Conservators themselves, who described them as “too large a development”. The planning permission granted in late 2012 by Wandsworth was quashed in May 2013 in the High Court for failing to provide an Environmental Impact Assessment following a separate legal action by FofPC.